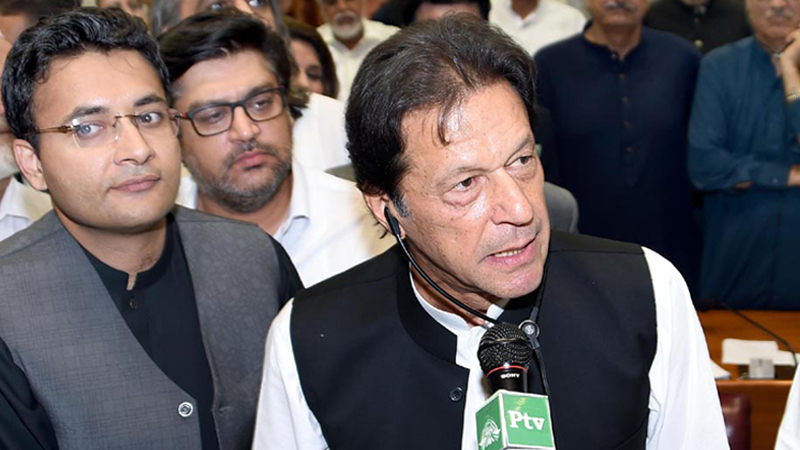 Delivering his first address as the 22nd Prime Minister-elect amid ruckus in the House, Imran Khan on Friday made several promises to the nation, regarding greater accountability for use of public funds, reforms to the electoral system, and his attendance in the National Assembly. Like his speech following the 1992 World Cup victory, a part of his speech was also about him, as he compared his political career to that of Quaid-e-Azam Muhammad Ali Jinnah. Regarding greater accountability, the PM-elect vowed to not spare anyone involved in plundering national wealth. He said that his government would conduct accountability for the increase in public debt over the past 10 years. He said the money which should have been spent on public services like hospitals and schools was embezzled by some individuals. Further, Khan said his government would not give an NRO to anyone, referring to the law passed by former dictator Pervaiz Musharraf’s regime ending accountability cases against the Pakistan Peoples Party (PPP) leadership and enabling it to end its exile in the 2000s. The PPP has maintained that the cases were politically motivated. Responding to the protesting opposition members, Khan assured them of his government’s cooperation in pursuing the matter of alleged rigging in the July 25 polls. He said he would not prevent anyone from going to the Election Commission of Pakistan (ECP) or the apex court because ‘we didn’t rig the polls’, but added that he would not let anyone blackmail him on the issue. Importantly, the PM-elect promised to hold himself accountable in front of the House, saying that he would hold question answer sessions in the Assembly twice every month. In the past, Khan was criticised for his low attendance in the Assembly. A report by the Free and Fair Election Network (FAFEN) revealed that Khan attended only 20 sessions of the 468 sessions of the previous Assembly. Earlier, Khan got elected as the 22nd PM of the country around 21-years after he started his political career with the formation of Pakistan Tehrik-e-Insaf (PTI). He secured 176 votes against 96 of PML-N’s Shehbaz Sharif in an election held by dividing supporters of both candidates into two different lobbies attached to the Assembly. Lawmakers from the PTI and its allied parties proceeded to Lobby A and those from the PML-N and its allied parties to Lobby B. The PPP members and a single member from the Jamaat Islami abstained from voting. The PPP had refused to support the candidature of Shehbaz Sharif and requested the PML-N to nominate anyone else for the election, a request not entertained by the latter. Media reports suggested that several PML-N leaders made last ditch efforts as late as the beginning of the Friday session to convince PPP chairman Bilawal Bhutto Zardari to re-consider the party’s decision. As soon as Speaker Asad Qaiser, who seemed lacking preparation to manage the session, annouced the result, PML-N lawmakers started chanting slogans in favour of their imprisoned supreme leader, Nawaz Sharif. The sloganeering continued during the PM-elect’s address. The session was scheduled to begin at 330pm but it could not be started on time owing to commotion in the galleries caused by the presence of a large numbe of guests. When the session finally started around 430pm as all the lawmakers were seated, the House was yet to be brought into order. PML-N’s Javed Abbasi and PPP’s Khurshid Shah protested over the situation, urging the speaker to ensure order before starting the proceedings. Earlier, PTI’s Imran Khan was the first major party leader to arrive at the Parliament. PPP’s Bilawal Bhutto and PML-N’s Shehbaz Sharif arrived subsequently. When he arrived in the House, Sharif stopped to shake hands with Bilawal, though without exchanging any pleasantries. He did, however, made a brief conversation with Khan as the latter came towards the opposition benches to great him. Khan will take oath as the 22nd PM of the country at a ceremony in the Presidency on Saturday (today) morning. He is expected to take up official residence in the Staff Colony attached to the PM House.